Taiz: A young wheatish-looking Mansoor Al Barakani is stationed in Al Robaei hill, south of Taiz city with a kalashnikov strapped to his chest. This is the first time Al Barakani is on the frontline along with other feisty and determined unemployed young professionals. They are a part of the popular resistance - a group formed by the residents of Taiz to defend the province from Al Houthi militia control. Before the start of the Saudi-led coalition bombing in March, Al Barakani used to work as a tailor for three years in Al Shaikh Othman neighborhood in Aden. Due to the intensive fighting in the south since April, that severely damaged main streets, homes, and hospitals, Al Barakani fled to Taiz, and found himself without work. After several unsuccessful attempts to find alternative work in Taiz, to support his wife and two daughters, he decided to join the popular resistance in the beginning of May. 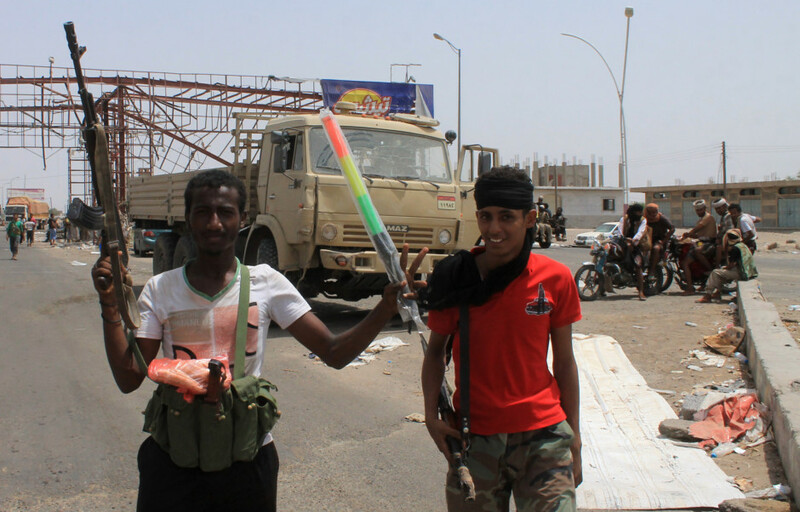 Even four weeks after Aden was recaptured by the Saudi-led coalition forces in mid-July , Al Barakani stayed in Taiz to fight with the popular resistance. “After weeks of looking for work, I decided to join the popular resistance as I was desperate for YR2000 [10$]. From the beginning of June they started to pay us YR4000 (20$),” Al Barakani told Gulf News. Al Barakani who comes from the Jabal Habashi area in Taiz said it’s not uncommon to hear of youth flocking to join their comrade in-arms without any prior knowledge of fighting. “I do not have experience in fighting, as I am a tailor by profession. But I use the rifle now. Also the popular resistance leaders provide training on when to strike or withdraw,” he said. Exact numbers of young professionals using weapons on the battlefront is unknown. But the protracted political instability and lack of jobs has spurred more unemployed professionals to pick up kalashnikovs to earn a basic income. A recent survey by the Yemen Studies and Economic Media Centre [SEMC] showed the private sector which accounts for 80 per cent of the country’s manpower has laid off more than 60 per cent of its workforce. In 2011, the significant disruptions in the supply and production, caused economic activity to contract by almost 11 percent, leading to higher unemployment, according to a World Bank Report, 2011. While there is no exact data to reflect Yemen’s unemployment after the Arab-coalition bombing, the centre indicated the numbers are said to be higher. Mohammed Al Romaim, member of the education syndicate in Taiz said dozens if not hundreds of professionals are fighting with the popular committees in Taiz. “In war conditions it is difficult to determine an exact number as people are only concerned about the military and political developments,” Al Romaim added. Al Barakani said his friends are fighting mainly to earn a living and support their families as they do not have alternative sources of income. “At the same time we will not let Al Houthis take over Taiz,” he said. The training by the popular resistance committees lasts for a week. The fighters are paid a remuneration from the leaders of the groups, and the income is divided based on the different areas they come from. Hammond Al Mikhlafi, an Islamic law graduate, who heads the popular resistance in Taiz lost his son Osama Al Mikhlafi, a doctor in the last week of May, whilst defending Taiz from the militia. When the war started in Taiz in March 2015, Mohammad Al Shaibani, 31, a physics tutor tried to secure another government teaching job, but there were none. His bright wide eyes which once shined with hope and optimism, were filled with tears, and anxiety about his future. While a majority are drawn to popular resistance for the income, Sakr Ahmad, another member of the committee said there are a few who are committed to defending their province. “Death is not a problem anymore, and there is no difference between death or life when it comes to defending my city,” he said. Unlike Al Houthi militants, Taiz’s skilled professionals are not trained fighters. A majority of the militia fighters are originally soldiers and use the weapons of the Yemeni army to fight the popular resistance. Fadhl Al Dhobhani, a sociology professor at Taiz University said for many, the war has become a main source of income, especially for the youth in Taiz, who could be potentially dependent on their weapons to earn an income in future.